The International People’s Tribunal addressed the many forms of violence during the period of the massacres of 1965–1966 in Indonesia. It was held in The Hague, The Netherlands, in November 2015, to commemorate fifty years since the killings began. The Tribunal, as a people’s court, holds no jurisdiction and was an attempt to achieve symbolic justice for the crimes of 1965. This book offers new and previously unpublished insights into the types of crimes committed in the 1965 genocide and how these crimes were prosecuted at the International People’s Tribunal for 1965. Divided thematically, each chapter analyses a different crime – enslavement, sexual violence, torture – perpetrated during the Indonesian killings. The contributions consider either general patterns across Indonesia or a particular region of the archipelago. 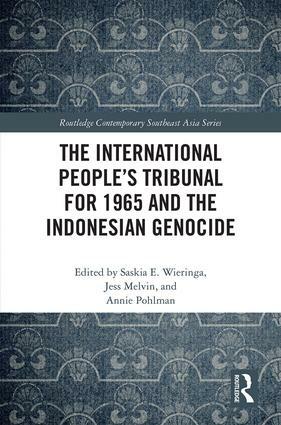 The book reflects on how crimes were charged at the International People’s Tribunal for 1965 and focuses on questions relating to the place of people’s tribunals in truth-seeking and justice claims, and the prospective for transitional justice in contemporary Indonesia. Positioning the events in Indonesia in 1965 within the broader scope of comparative genocide studies, the book is an original and timely contribution to knowledge about the dynamics of the Indonesian killings. It will be of interest to academics in the field of Asian studies, in particular Southeast Asia, Genocide Studies, Criminology and Criminal Justice and Transitional Justice Studies.